These New Humans will assist humanity to evolve into a higher frequency of the 7th dimension. This also includes the Earth’s evolution. These children carry divine codes and wisdom within their souls. 1. Inherent soul gifts which need nurturing from birth. 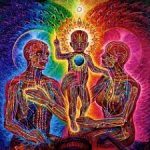 In fact, these New Humans need help from the mother , as well as energy clearing while in the womb. I have found this true particularly for Sun Children being born 2012 onward. 3. These New Humans will create the new; a new world with harmony, peace and Unity. They refuse to follow the self-destructive ways of the old matrix of present humanity. 4. New Humans drive, motivation and passion powers them from their soul. 5. These New Children have many powerful extra sensory gifts beyond the ordinary human. They intuit who you are, your energy and your hidden motives. They feel, know and see you; it is futile to lie or hide anything from them. 6. Finally, the New Human Children have advanced DNA. They will anchor the original Adam Kadmon body and frequency. This body represents the original perfected state of our DNA. We all had this before other races tampered with our DNA. This Adam Kadmon connects us with the Divine Will of God. In conclusion, we all, in our willingness to be on this planet now, signed up to assist these New Children. This requires recognizing and healing the patterns of separation within ourselves. Names for New Children Crystal – Rainbow Sun etc. describe some common traits of groups of individuals. These groups came in at certain periods of time. The periods of time, again, represent approximate dates. Nutrition: You may dislike junk food. Fast food may make you sick. You may feel healthier with more non-GMO and organic foods. Drugs: You may experience medications as harmful to you. Medications may wreak havoc with your body. Education: Regular school may be boring. Sometimes you know more than the teacher. You want to explore subjects that excite your passion to learn. Mission: You may have talents or potential as an artist, healer, musician, mathematician, scientist or activist for animal, human or environmental rights etc. 2. What Do Different Labels Mean? These labels used represent shared traits based on subjective observation. Thus, there exist no hard and fast guidelines. Names such as indigo, crystal and rainbow describe some common traits of groups of individuals. These groups came in at certain periods of time. The periods of time, again, represent approximate dates. Some children can be a combo of traits from 1 to 2 groups. Recognize the uniqueness of each child without too much focus on a particular label. Each group enters to create specific changes in an established matrix which no longer serves the highest good of humanity. 3. Why Have You Incarnated on Earth? Do you refuse to follow the destructive ways of humanity? Have you extra-sensory gifts beyond those around you? Do you feel or know what others feel or think? Have you a sense of others hidden motives? Do you possess a high level of creativity? Do you desire to create a world with greater peace and unity? You may be a Crystal, Rainbow, Sun child or a Starseed etc. 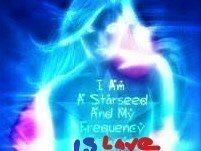 You have come to assist humanity and the Earth evolve to a higher frequency. You possess creativity and gifts beyond the average human. You have abilities to solve the challenges in the world from a higher level of consciousness. 4. Does 3D Earth feel foreign? Do you feel different? Do you feel you belong in another place? You may feel different/alone. You may sense you came from some place far away. You may feel as if you were born in the wrong time. You may think you were born to the wrong family. Whatever star system you originate from know you came to Earth by choice. You came to use your abilities to make a difference. I suggest find the best outlet to progress with and exercise your creative abilities. This may be art, journaling, healing, study of math or science etc. Develop confidence in expressing yourself; what you know in your heart to be truth for you. 5. Do You Feel Unique? Every child has a uniqueness. Crystal and Rainbow children tend to have more abilities than the average child. Some gifts may be more developed. Other gifts have yet to develop. Parents can assist the child by recognizing, affirming and nurturing their abilities. The parents and child can create an experience of learning and growing together. A child’s gifts need nurturing from birth. In fact, I have experienced the Sun children in the womb begin to show and use their gifts. These children need ongoing aid from the mother. They also require ongoing energy clearing while in the womb. Find an intuitive skilled energy healer. Parents help their child by accepting, loving them and allowing them to express the truth of who they are. 6. Are You an Empath? Do you feel deeply? Have you been told you’re too sensitive? An Empath feels what others feel. It’s a challenge to know what emotions are yours and what belong to someone else. Have you ever entered a grocery store and felt drained from all the people? Because of your heightened state of feeling others, you pick up all their emotional states. It’s crucial to differentiate what energies are yours and what is someone else’s. 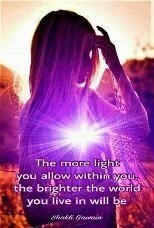 Learn to set energetic boundaries. Acquire methods to energetically clear yourself.